In many ways, I’m a cheapskate, especially when it comes to car repairs. I took auto capstone back in high school and have a basic knowledge of how things work. I try to do all my own repairs within my expertise and the practicality of fixing it myself with the tools I have available (as well as patience). 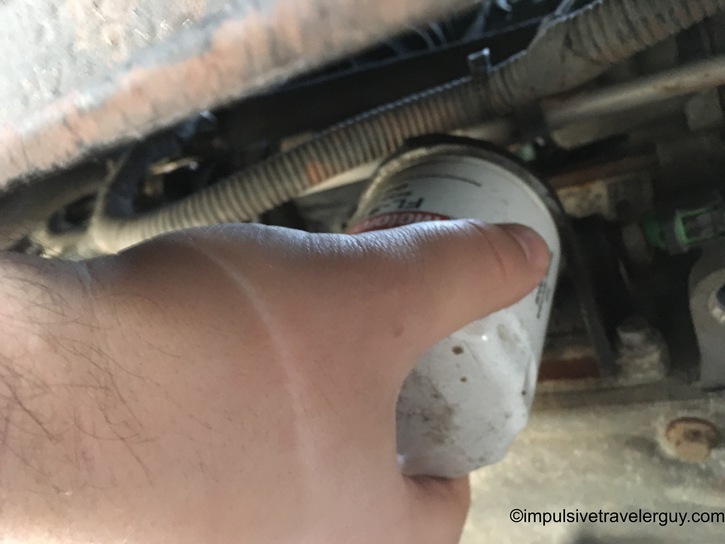 I know where my limit is, and do take the car in when I know it’s way easier for a garage to do it or it goes beyond my knowledge to quickly fix it. I have fixed a fair amount of things including the AC, installing a new radio, and replacing the side mirror. One thing I will not take my car to a garage to do is oil changes. Basically, I can change the oil with full synthetic oil and a good filter for $25-30. It would cost $60-70 at a trustworthy garage. That means, if I saved $30 each time, I’ve literally saved around $1500, so far, since I got my car (245,000 / 5,000 * $30). That’s a decent amount of money! 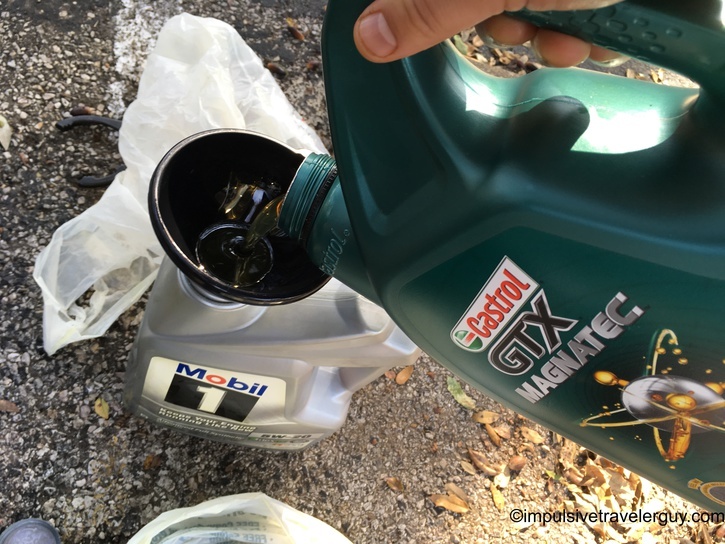 I’ve changed my own oil in all of my vehicles myself except for 3 times. The first time was included when I bought the car. The other time my dad did it for me as a surprise when I was up in Wisconsin one time and was taking a nap. 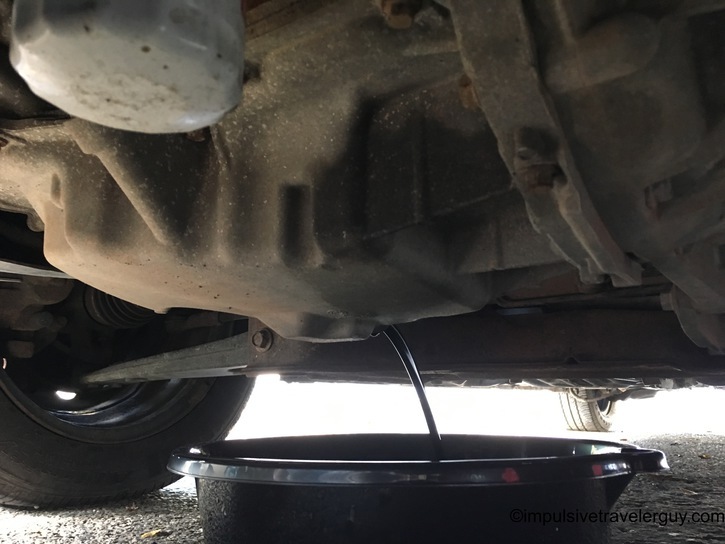 I did also have the Cougar’s oil changed while I got it timed because it was much easier them doing it while it was in the garage. Now living at an apartment, it is a bit of a challenge to work on a vehicle. 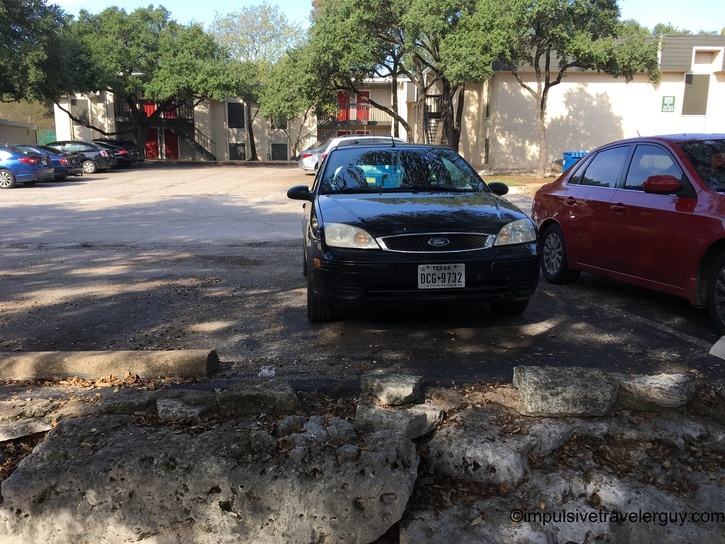 You obviously have to do it in the parking lot and, with the oven Texas can be, you have to be careful about the pavement getting hot. This time of year in the fall, it isn’t so bad, but that’s something I have to watch out for in the summer. 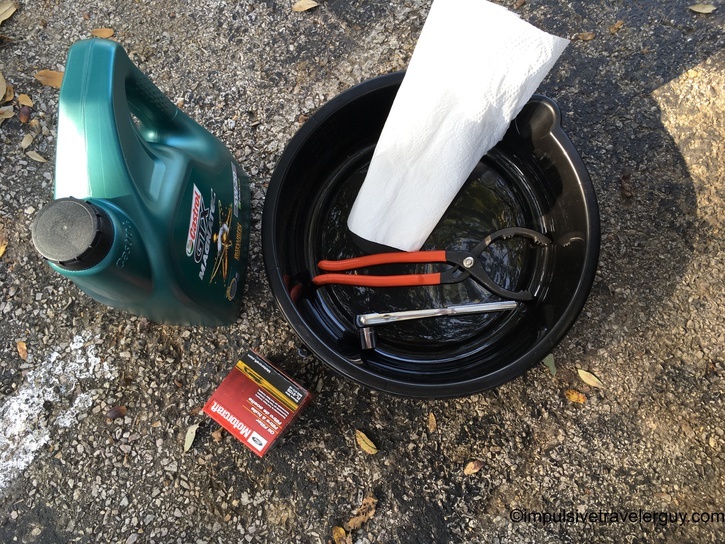 One of the easiest ways to change oil, and also the cleanest for the apartment, is to head to Dollar Tree. 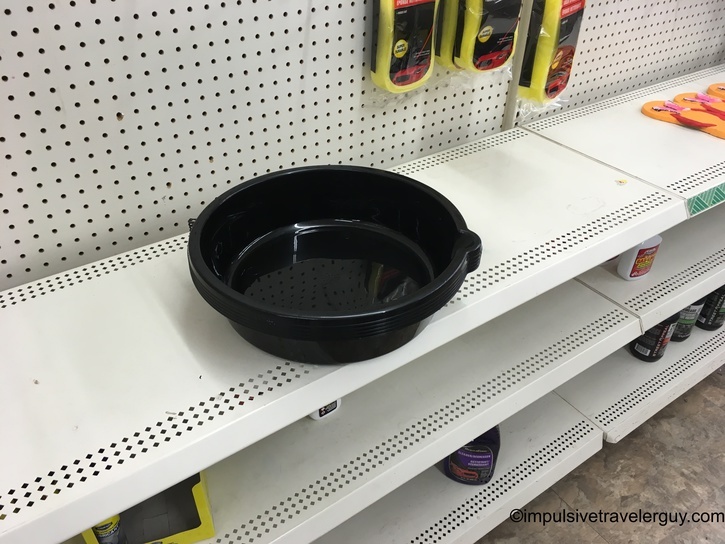 They have a $1 oil drain pan and also a $1 funnel. You can throw them out when you are done with them. After getting my mileage where it needed to be from my trip to Eagle Pass, Piedras Negras, and Waco, I was ready to head to Dollar Tree and get my supplies. For oil and a filter, I usually go to Walmart and buy a 5 quart jug of Mobile 1 and a Purolator filter. Gotta love good ole Walmart for not having what I needed. I didn’t want to fight the big city congestion, so I got Castrol Syntec and a Motorcraft filter. 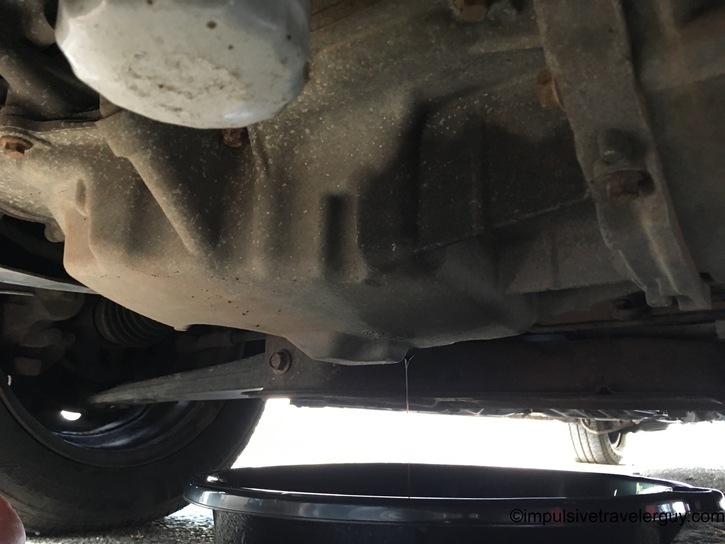 I parked the car out so I could crawl underneath and got everything ready to change the oil. 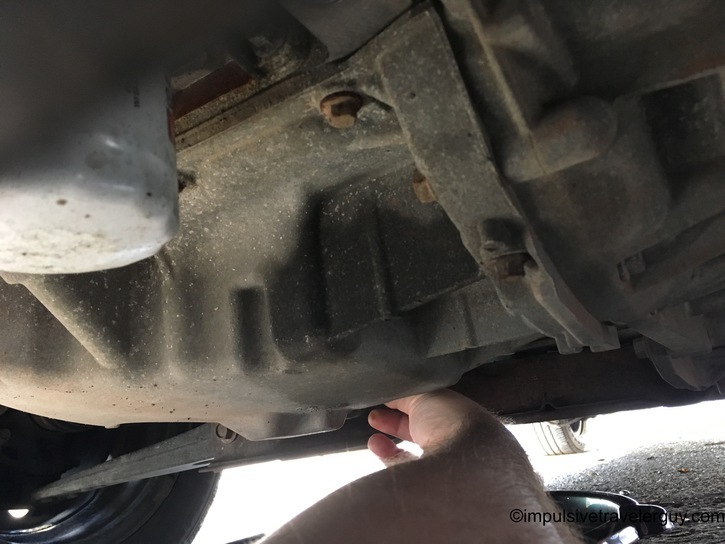 The nice thing about the Focus is I can crawl underneath and get to the oil drain plug and filter without having to jack up the car. 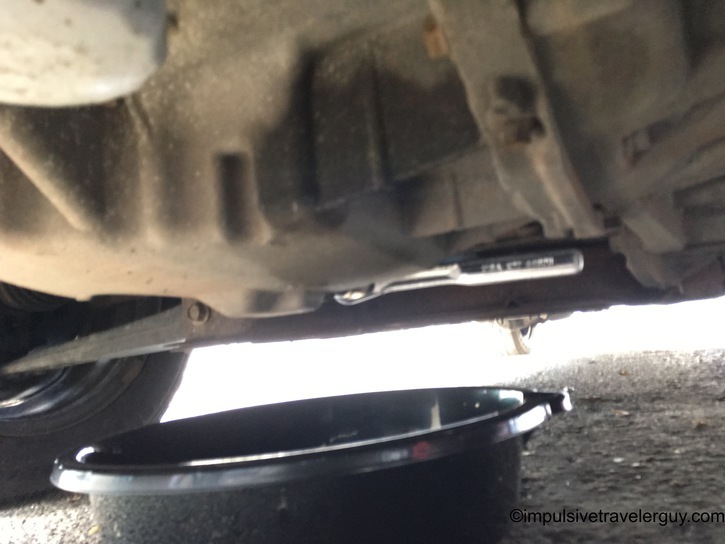 The cheap drain pan makes it easy to get the socket wrench on and turn the oil drain plug loose. I loosen the oil drain plug with the wrench enough to then unscrew the rest of it with my fingers. I then let the oil drain out. I then put the oil drain plug back on and take off the filter. I must have an iron grip because most of the time I can get it off with my hands and don’t need a filter wrench. It often takes a hard turn, but eventually it works its way loose. I lube up the O ring gasket on the new filter and then put it on. I grab one of the cheap funnels and start pouring the new oil in. 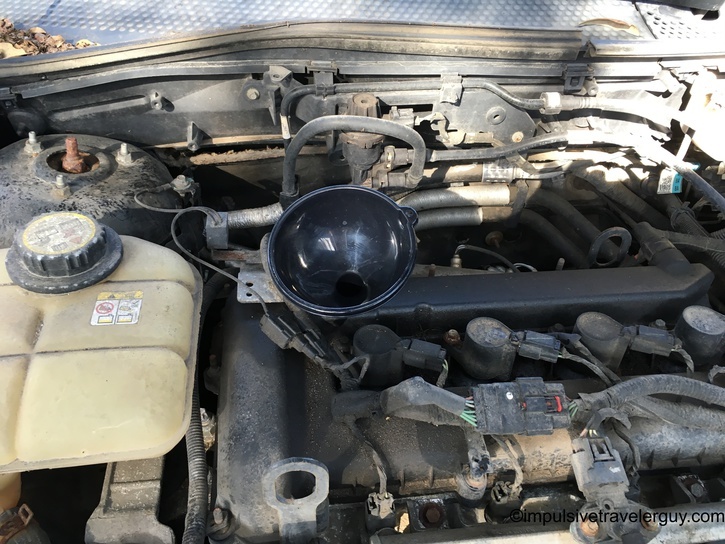 After pouring the oil in, I put the cap back on and start up the car to get the new oil flowing. Once I confirm everything is good to go, I close the hood and that part is all done. The one weird thing about my Focus is it takes 4.5 quarts and not 5 quarts. That leaves me with half a quart each time. I guess that means it’s a free oil change (minus the filter) every 9 oil changes. I pour that extra half quart into another 5 quart jug. 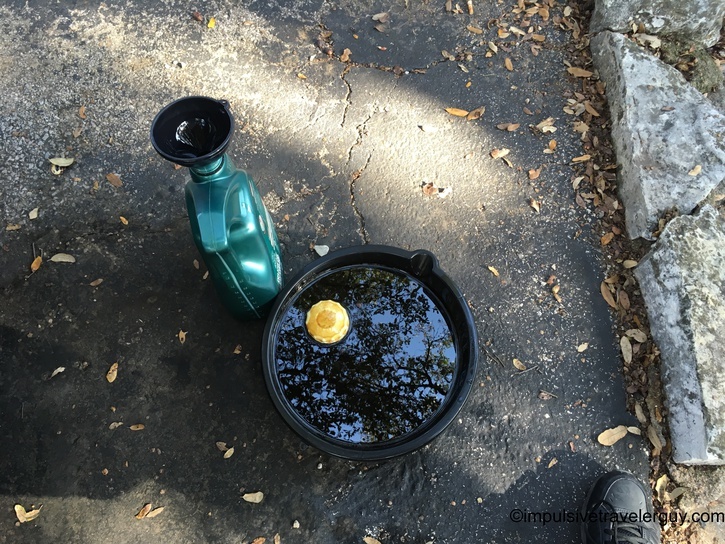 I then take the waste oil from the oil drain pan and pour it into the other 5 quart oil jug. 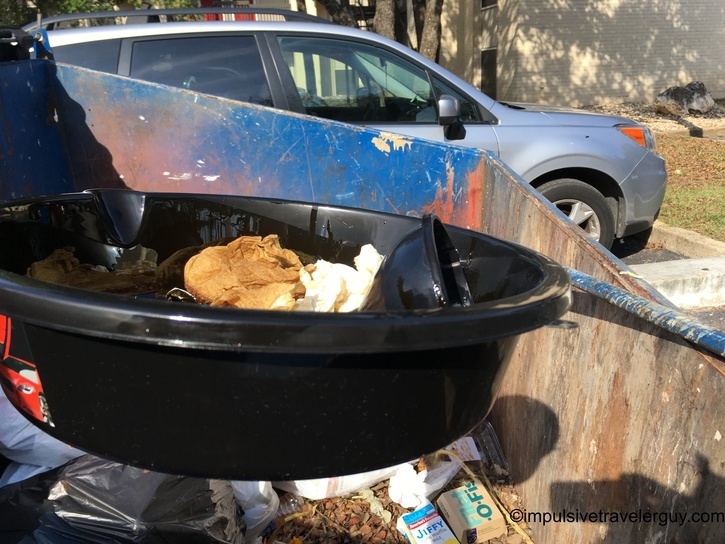 After that, it’s ready to get all the trash together and throw it in the dumpster. There you have it! 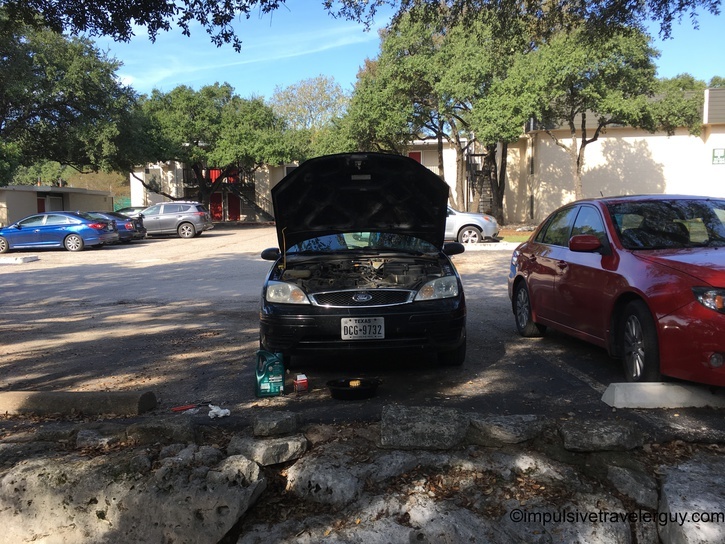 That’s how I change oil in the parking lot of my apartment and save a bunch of money doing it. 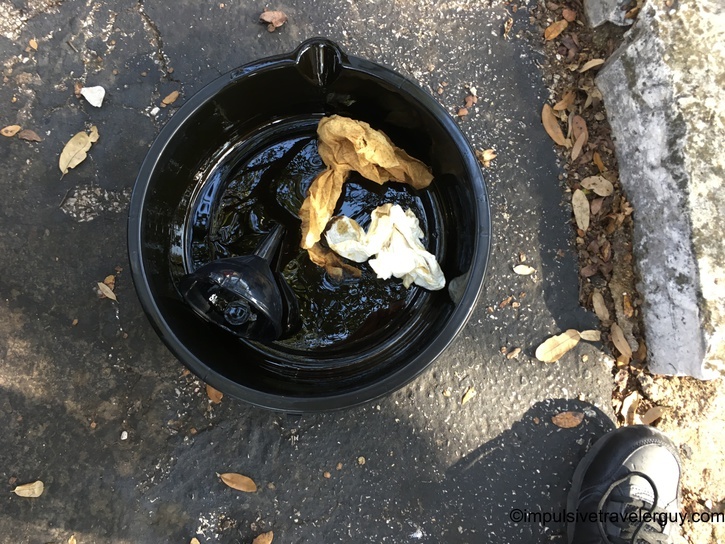 After the oil change, I take the waste oil to AutoZone or some other place that accepts it. I actually surprised myself calculating how much money I save (and continue to save) doing this myself. I highly doubt I’ll start taking it somewhere for someone to do this anytime in the near future. I guess I must be doing something right as the Focus is about to hit a quarter million miles soon!